I recently came across a denizen of the Internet who, to put it mildly, criticized the still-airing Fate/Stay Night: Unlimited Blade Works for being “shallow and incompetent”. He lambasted multiple aspects of the show, notably including its “adaptation quality”. For those not aware, Unlimited Blade Works is an anime adaptation by the production studio ufotable of a 2004 visual novel, Fate/Stay Night, and is (according to this individual) “a joke compared to the source material” and practically ”a Michael Bay movie”. Of course, this isn’t the first time I’ve encountered a fan disappointed by an adaptation of their favorite visual novel, and I doubt it will be the last. However, it brings to mind a pivotal question of the anime medium (and indeed, any medium concerning adaptations): at what point should adaptations stand alone, separate from their source material? If a work is excellent in its own right, but a poor adaptation, can it be considered objectively “good”? 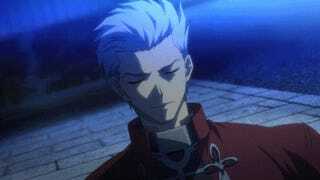 For the record, I think Unlimited Blade Works is anything but shallow and incompetent. 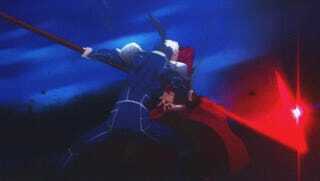 I am perfectly happy with the job ufotable is doing, and consider the series a stellar piece of work, flaws and all. However, perhaps this is due to the fact that I have a weaker nostalgia for the source material. My first contact with the Fate franchise was the 2006 anime by Studio Deen (an adaptation considered by many to be subpar at best). 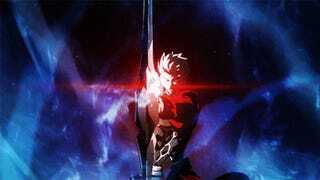 Later, in a move that would likely horrify visual novel fanatics, I saw Deen’s Unlimited Blade Works film, a rushed and incomplete version of the same story being told in ufotable’s current anime. 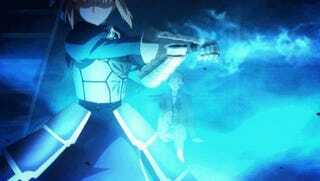 I went on to tackle Fate/Stay Night’s prequel story, Fate/Zero, and only then did I step up to the plate and play the original visual novel. Therefore, I have no strong affinity for the visual novel as the sole “correct” version of Fate/Stay Night, simply because I was exposed to it later than its adaptations. In fact, it’s possible that I’m able to enjoy Unlimited Blade Works as much as I am due to my relative indifference regarding the source material. Similarly, I have two friends whose only prior experience with the Fate franchise is Fate/Zero, and both are loving Unlimited Blade Works. So, that brings me back to the main point: is it “wrong” to experience a story a certain way? Was it “wrong” of me to be corrupted by supposedly lackluster Fate adaptations rather than use the visual novel as a jumping-off point for the rest of the series? I don’t believe so. An adaptation, by definition, is not a supplement but a substitute. It is meant to stand on its own as a solitary means of entertainment, not be crippled by linkages to its forebear. It’s not fair to call something inferior merely because it fails to perfectly adapt that one moment you loved. Just because the first version of a story happened to be published, well, first, doesn’t mean that it is inherently the best version of that story. Take Clannad or Steins;Gate. Neither are exact adaptations of their respective visual novels, but both are acclaimed by the anime community at large and both are completely accessible as standalone experiences. A series could even be warped significantly in the adaptation process and that’s okay, as long as it still appeals to its audience. 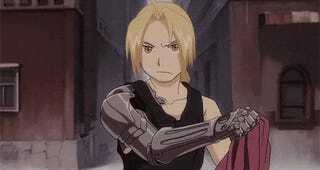 It’s fairly well-known that the 2003 Fullmetal Alchemist diverges dramatically from the plot of the manga around the halfway point, while the later reboot Fullmetal Alchemist: Brotherhood adapts the entirety of the original storyline. As a viewer who has never read the manga, I immensely enjoyed both shows. I give neither the inherent quality of being “better”, even if one is more faithful to its source. In fact, in some ways, I prefer the 2003 anime! I consider both series to be two sides of the same coin, two different tales sprouting from the same starting point, rather than the “real” story and its crappy offshoot. I’m not defending bad adaptations, and that was never the point here. Rather, I’m trying to qualify what should and should not be considered a bad adaptation in the first place. An adaptation should be considered “bad” only when it becomes illogical, nonsensical, contrived or otherwise irreparably broken for the uninformed viewer (looking at you, Tokyo Ghoul √A). Changes and additions to the original story are not flaws in and of themselves. There is no right way to tell a tale, so it follows that adaptations should be weighed on their own merits, separate from lingering connectivity to their source material. For all you know, there are fans out there loving that “shallow and incompetent” adaptation, but that doesn’t make them any less fans.